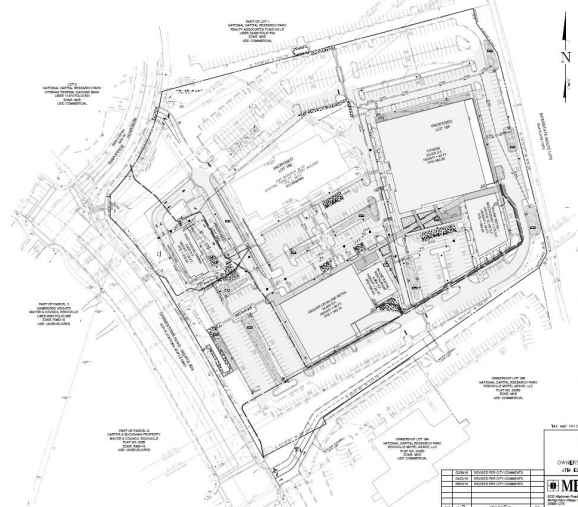 A plan for a new shopping center at 1401 Research Boulevard got the green light from the Rockville Planning Commission last night. The unanimous vote by commissioners means the Rockshire neighborhood will once again have retail options within walking distance of their homes. And via their bikes, as one of the most-discussed issues was the question of just how great the demand would be for bike parking at this property. The new shopping center is currently branded as Research Row. 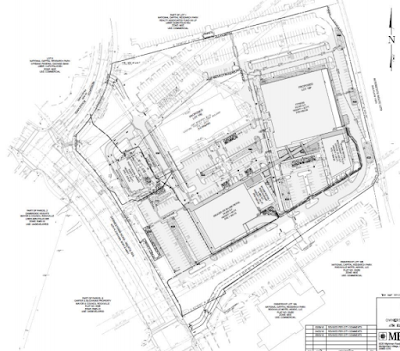 It will include a 40,000 square foot fitness center, with swimming pool and full-size basketball court facilities; a drive-thru fast food restaurant close to the Route 28 side of the property; an in-line retail building (the latest term for "strip mall") with office space; and a smaller-than-usual 28560 SF grocery store building (grocery stores can be 60-70,000 SF, or even bigger in the case of Wegmans). Getting a grocery store tenant could be critical to the success of this retail center, with Rockshire having lost its Giant store. Commissioner David Hill asked the applicant, FP Research Boulevard, LLC, if their fitness center was viable. 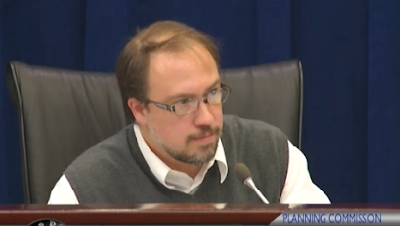 The city is experiencing "a saturation of fitness facilities," Hill noted. Adam Davis, a Vice President at Foulger-Pratt, said that the gym structure will be "a pretty generic 40000 square foot box" that could easily be converted to other retail uses, if necessary. Other concerns included how traffic exiting Hurley Avenue from the site onto inbound W. Montgomery Avenue would affect already-congested rush hour traffic trying to reach I-270, and the dangers of cars trying to turn left onto Research Boulevard from the curb cuts on that side of the property. Signals and striping will be modified for both roads, representatives for the applicant said. While not the fault of the applicant, the downsides of a Countywide push by political leaders to replace office parks with residential, and to a lesser extent, retail, surfaced during the nearly-four-hour discussion. The prospect of losing high-wage office and research jobs (one structure removed for this project was a laboratory) did not sit well with commission chair Charles Littlefield. Replacing those high-wage jobs with retail and restaurant positions is "just not good for people's economic well-being," Littlefield said, although he was supportive of the project in general. A second problem of the conversion - the rest of the office/research facilities (there's a reason the road has its name, after all) are still there. One of them, a biomanufacturing facility that manufactures vaccines, is directly adjacent to the future shopping center. The site manager for the biomanufacturing facility said unidentified cars and trucks are always a security concern for them as it is. With truck traffic now increasing with the shopping center, that could present a problem. The site manager said their federal contracts depend on having tight security for their facility. It takes four keycard swipes just to get from his car to his office, he said. Trucks are examined closely for fear that they may contain explosives, and be used in a terrorist attack on their facility, which handles dangerous diseases its vaccines cure or treat. They not only are concerned about the standard terror threats from abroad, he said, but also from the Animal Liberation Front. While their facility has no animals on-site, he said, the ALF could mistakenly believe there were. Hill said he was "concerned" about the security issues raised by the site manager, who said he was not aware of any facility like his in the region that was this close to a retail center. I'm hoping that drive-thru restaurant will bring a new fast food brand not currently in Rockville, or at least return one that left town in recent years. "Two menu boards that taper down to one lane at the pickup window" sounds a lot like a common layout at newer McDonald's locations. It would be nice to get a Hardee's, Jack in the Box or White Castle in terms of new ones, or bring back KFC or A&W. Hill called Research Row "a great addition to this area of the city." 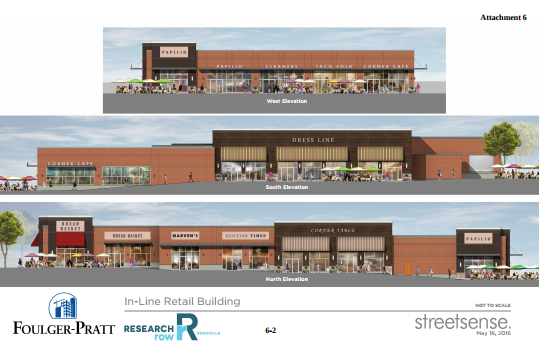 This redevelopment strikes a serious blow to the reuse of the retail center on Hurley Avenue. Once the Giant food left the center has gone in decline. As a commission member I would have rejected this development as detrimental to the neighborhood retail use currently existing on Hurley Avenue. Aeras manufacturers tuberculosis vaccines and they are primarily funded by the Bill and Melinda Gates Foundation, in addition to grants from Europe and a few from the United States. If they are as paranoid about security as the site manager suggests, that's a really bad location to begin with. This will not substantially change things, other than increasing the traffic to an already known site. It's just someone flapping their gums for no reason.